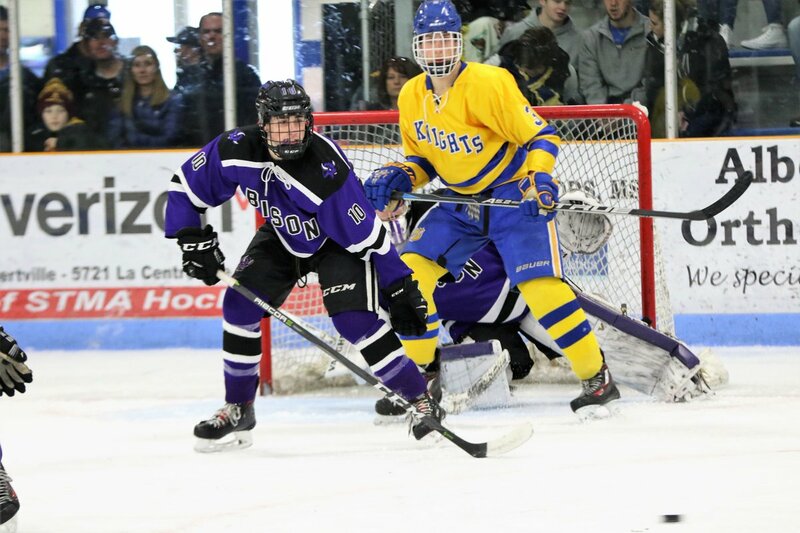 St. Michael-Albertville and Buffalo have one thing in common when it comes to hockey – they both have sophomores leading their respective team in scoring. Sophomore forward Adam Flammang's one goal and one assist added to his team-leading totals of 18 goals and 35 points, leading the Knights to a 4-0 home win last Saturday over the Bison. From the opening shift of the game, the Knights came out flying. They set the tone early with big hits and two quick goals. Flammang setup teammate Cody Kelly for the game's first score just 1:11 into period one. Lane Berning made it 2-0 for the Knights with a goal just 20 seconds later. A quick Bison timeout followed, and Buffalo started to play on its toes towards the end of period one. For STMA, a fast start was necessary knowing plenty was at stake with one week remaining prior to the section playoffs. 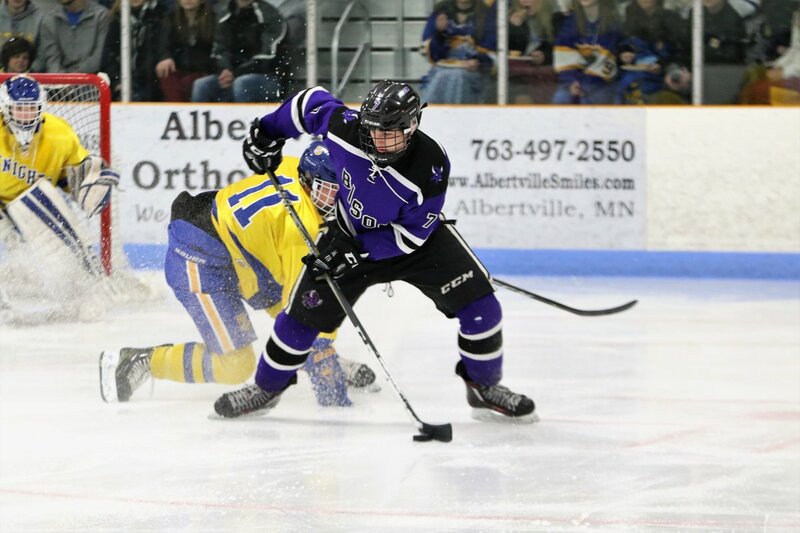 Besides going for the sweep of their cross-town rivals, whom they defeated 4-3 in overtime earlier this season in Buffalo, a win meant Flammang and the Knights would clinch STMA's fourth consecutive Mississippi 8 conference title. "It was pretty big," said Flammang, on grabbing a quick 2-0 lead. 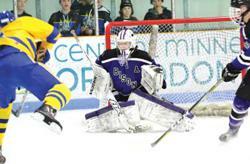 "As the game moves on, we know their goalie, (Nathan) Mueller, usually gets much better. We came out playing hard and kept hitting them, trying to take people off of their game." The majority of the hits were targeted at the Bison's leading scorer, sophomore Jake Braccini. Starting with his first shift of the game, Braccini and his linemates of Tyler Braccini and Ben Klein were being hit seemingly on every puck possession. For Mueller, after a surrendering two goals on three shots to open the contest, he settled in and started to stonewall the Knights until Flammang made it 3-0 at 11:20 of period two. "When you dig yourself a hole, it's always hard to get out of," Mueller said. "We didn't come out as hard as they did. They really took it to us, especially in that first two minutes." Prior to Flammang's goal, Buffalo was winning puck battles for most of period two, but still trailed 3-0 after 34 minutes. The deficit may have been worse, but Mueller successfully stopped three of five STMA breakaways in the second period. Mueller gave a little insight as to his thought process when facing breakaways. "Mostly, stay with the puck," he said. "When they are coming, you have to get the pivot and stay in front of it the best you can. From a shot that tight, you're not going to make a reactionary save to stop it, so you just have to be in really good position." STMA tacked on a late goal in period three by Blake Spetz, who swatted at a loose puck past a diving Mueller. Mueller finished the night stopping 42 of 46 shots, including a number of high quality shots during a 2-man advantage for 1:12. "Nathan gives us a chance every night, and he did that again this game," said Bison Head Coach Aaron Johnson. "After the start and before the fourth one they scored late, there's enough positives to take away from this game. They (STMA) are a good team and a tough matchup for us, just with their maturity, their size and speed. With our group, we're not at that physical maturity yet. Hopefully we'll get there." Flammang praised Mueller afterwards for his play in goal. "He's got a great glove, so you try and stay away from that," Flammang said. "When you play against him, you just try and get people in front to tip shots, and do the best you can to get pucks in." Justin Damon also made some key saves, particularly on the Braccini line. Damon made 27 saves to record his fourth straight shutout for the Knights. Despite the shutout, Johnson praised his top line, and his young star for playing a strong game. "I think you're starting to see them adjust to it," said Johnson, on his top line being a target in recent games to the physical play. "It hasn't been easy for them, but I thought Jake in particular is playing through it. He probably had 5-6 quality scoring chances tonight. Teams are really focusing on him, Ty and Ben. Even though they didn't get on the scoresheet, I thought that was one of their better evenings." Buffalo (13-11 overall) assured itself of at least a .500 record or better this season with a 3-2 road win Tuesday night at Hopkins. Second-period goals by Jake Braccini and Devin Huebner helped give Buffalo a 2-1 lead after two periods. Ben Klein's goal at 3:31 of period three proved to be the game winner. Ryan Nelson and Treyton Welch assisted on Klein's goal. The Bison outshot the Royals 29-14. Buffalo concludes the regular season with a 7 p.m. road game Thursday, Feb. 15 at St. Louis Park. The Section 8AA tournament begins next Tuesday, Feb. 20. Seeding was not available at deadline. First period: STMA -- Cody Kelly (Adam Flammang) 1:11; STMA -- Lane Berning (Jordan Drobinski, Garrett Sandberg) 1:31. Second period: STMA -- Flammang (Luc Laylin, Nate Swenson) 11:20. Third period: STMA -- Blake Spetz (Zach Sjelin) 15:41. 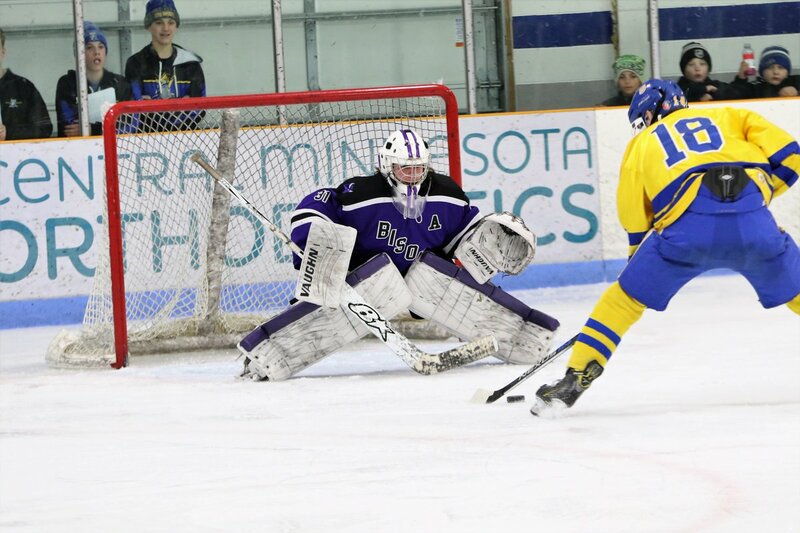 Goalies: B – Nathan Mueller (loss) 46 shots, 42 saves; STMA – Justin Damon (win) 27 shots, 27 saves. Shots: B – 8-7-12 – 27; STMA – 17-11-18 – 46. Power Plays: B – 0-4; STMA – 0-3. Second period: B -- Jake Braccini (Cal James) 7:39; B -- Devin Huebner (J. Braccini) 11:36; H -- Reese Bloom (Tom Gazich, Conner Staack) 14:33. Third period: B -- Ben Klein (Ryan Nelson, Treyton Welch) 3:31; H -- Jackson James (Henry Sweeney, Wyatt Nelson) 12:13. Goalies: B – Nathan Mueller (win) 14 shots, 12 saves; H – Bobby Wilson (loss) 29 shots, 26 saves. Shots: B – 10-15-4 – 29; H – 7-3-11 – 21. Power Plays: B – 0-1; H – 0-3.